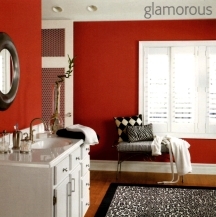 Red paint shades are the drama queen of paint color palettes, always ready to impress. Learn how to tame this flamboyant color and use it successfully for painting and decorating your home. 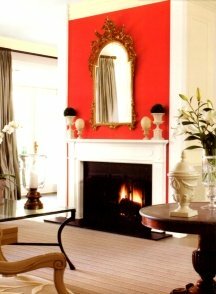 You cannot help but react to rooms painted and decorated with vibrant shades of red. It's the quintessential accent color that excites our senses and activates blood circulation. ...would you say it's true for you? After all, you are here looking for red painting ideas. Leave a comment at the end of the page! Powerful but versatile, red paint shades can work both in traditional (red barn paint color) and contemporary (tomato red) environments. They are especially great for northern climates, where their natural heat detracts from a lack of bright daylight. Cherry red, tomato red, red currant, scarlet and poppy red are real scene stealers - they cannot be ignored! But these pulsating and arousing shades can also be tiring and too stimulating when used in large amounts. So don't paint rooms that are in constant use a fire-engine red. The only exception would be rooms with large windows, lots of furniture against the walls and oversized wall art - because in rooms like these, you will see only a fraction of the wall space and color, making the impact more manageable. Otherwise, save this dramatic hue for an accent wall, colored furniture and accessories - with its brilliance, it will provide all the drama you need even in smaller amounts! Remember that just a little bit of red can go a long way. So start small, see how you like it and how much red you can take - you can always add more color if needed. Also keep in mind that a saturated, candy apple type of red color needs to be tempered and surrounded with plenty of clean neutrals. 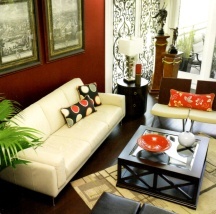 Touches of yellow, fresh green and purple make great complementing accents in red color schemes. And if you combine a bright red with off-white, gold, black and a touch of blue or green, you will get a traditional Oriental palette. 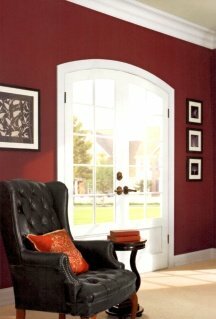 Barn red paint color, wine red, burgundy, red mahogany and black cherry - these shades are considered classic. They are rich and luxurious, but less dominating and easier to live with than the brighter reds. Considering painting a whole room red? Use one of these earthy, muddy paint shades. Much more complex and toned down than primary reds, these hues look almost neutral and understated - well, as far as reds go. Don't worry, they still get attention and turn heads, but without screaming at you. A dark red color is very popular in dining rooms, where it looks very elegant and dramatic. But red walls in a bedroom can also be really mesmerizing, and will help create an intimate and romantic atmosphere - especially in low lights. These historic paint colors pair well with different shades of blue, greens, grays, browns and other neutrals. Because they often tend to look dark, a grayed yellow also works great as a balancing color - it creates an illusion of sunlight and brightens up the scheme. NOTE: remember that white woodwork will make deep red paint shades look more intense. If you want a subtler effect, avoid harsh contrasts by keeping your wall color and woodwork at similar tonal values (consider staining your woodwork, or paint it with a color mimicking natural wood shades). And if you want to have the best 10 shades of red at your disposal, take a look at the Paint Color Cheat Sheets - the homework has already been done for you! Want to see some real life examples of rooms painted in different shades of red? Take a look at these photos and stories submitted by our readers. And if you have your own red room painting project to share, click here and see your name in lights!